City Lights is such a fun place! This top is adorbs! You look so pretty! I love the high pony with the OTS top. I really love this one! It is very much my kinda style :) Loving those great shoes and I just love the colour of that top so great! You look so cute girly! All of your pictures are so fun! You always look like you're enjoying yourself! I can not get over this top its so cute and tons for fun! great look lovely lady! You are so stinkin adorable and I love this color on you! That top is so cute on you, loving that color for fall!! LOVE the color of this top and you are just too adorable! Love this OTS top! The whole outfit is adorable. 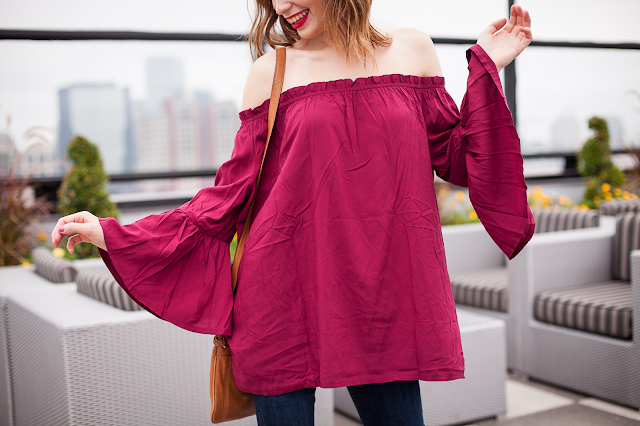 Off the shoulder tops are seriously my favorite! This is super super cute! I love off shoulder tops too! They are so flowy and easy to wear. Absolutely love how you styled this! Your shoes are so cute too! Your hair looks amazing too, that volume! I love the color of this top! I love seeing re-styled posts because as a blogger AND a real person, it's just not realistic for me to shoot entirely new outfits all the time. (I mean, I wish, but that's definitely not happening in the near future, haha!) Thanks for sharing! I love the color of that top - such a pretty color for fall! And I love how you styled this outfit, especially with the skinnies and the wedges!